The Sceedo 2 In 1 L6055 Remote Controlled Flying Quadcopter Drone and Four Wheeler Multipurpose Vehicle with 300k 720p HD Up To 2 Megapixel Interpolated Camera is a Altitude Hold Flying RC Car Quadcopter Drone Land and Sky 2 in 1 is not only a flying Quadcopter. It has four large, rugged wheels with four-wheel independent drive for exciting off-road racing. 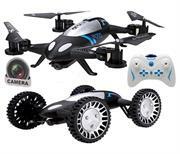 When in flying mode, you can easily control it to rise, fall, fly forward or backward, fly sideward, hover and turn left or right as well as perform 360-degree flips and rolls. When it lands on the ground, it transforms to a 4WD racing car that runs four directions. With only 2 minutes switch time between car and fly mode, you can instantly take to the skies as the propellers are powered by the same motors that operate the wheels. Just simply tilt the motors up or sideways depending on your preferred mode of entertainment and you can get up to 100m transmission range. 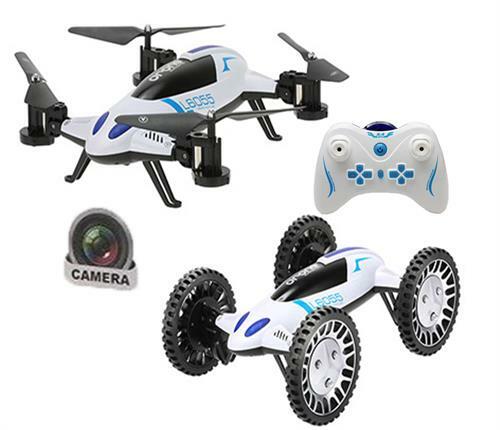 This well-thought-out drone also features an altitude hold system and is extremely well programmed making it the ideal gadget or gift for any beginners or advanced pilots. Moreover, it is equipped with high density air pressure sensor to enable altitude hold mode. Now you can be the James Bond with your own adventures. Experience high powered torque in car mode with its multi-terrain treads that can take on rocks, dirt, grass, debris and much more.